Alternate games are always welcome. If you don't own the top voted game, you can host the highest voted game you do own and players can jump back & forth as they want. The Event is Friday but the 3x XP continues through the weekend! Color me surprised that Halo 4 didn't have a stronger showing. Red Dead Redemption takes the win! I'll start spamming invites around 8pm GMT (3pm EST) Saturday, but feel free to get started without me if I'm M.I.A. 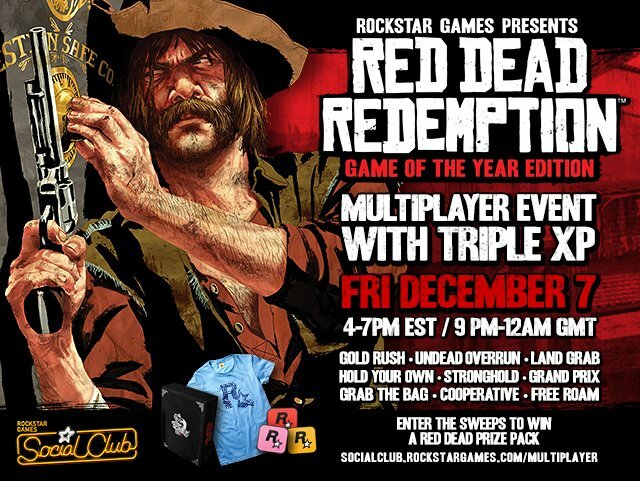 Also, as I mentioned before, if anyone doesn't have RDR you're welcome to host an alternate game. I'm sure there are multiple people that don't own RDR but would like to play a game. If anyone who doesn't have RDR (like me) would like to play Halo 4 or Gears 3 let me know.